Sometimes the fact checkers are right. But hang on a minute, fellow travelers of the Right. 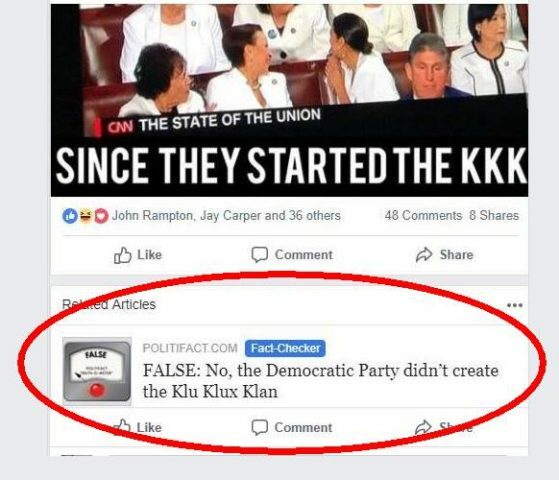 Since it is historical fact that the original KKK was formed by six former Confederate soldiers in Pulaski, TN, PolitiFact is *technically* correct. One could argue that the Democratic Party had a hand in its creation by being a major part of the circumstances that ultimately led to that creation, though. (By which I mean, secession and the Civil War.) And I have absolutely no doubt that Klan elements have had some measure of control over the Democratic Party ever since. On the other hand, the Republican Party is not necessarily clean-handed in this regard — there was a time in Indiana when the GOP was in control of the state and at the same time was heavily infested with Klansmen. I speak of course of the 1920’s and the D.C. Stevenson Klan. Indiana Democrats actually came out *against* the Klan at their 1923 state convention. And then there are arguments that the Klan of the early 1900’s was not the same Klan that Forrest ordered shut down. And that the Klan of the 1920’s was not the same Klan as the one in the early 1900’s. And that the Klan of today isn’t really related to the Klan of the 1920’s. There’s plenty of historical evidence out there to argue the point, but most people would rather argue what they think they know rather than do that icky research. But the bald statement “The Democratic Party created the KKK” without any other qualification is demonstrably false. Six pissed-off butternut veterans created the KKK, for what they considered to be good reason, and it went on from there until Nathan Bedford Forrest, its Grand Wizard, ordered it to disband in 1869. Subsequent iterations of the Klan more likely drove the political parties as opposed to the parties driving the Klan (and we can see that clearly in the historyof the D.C. Stevenson Indiana Klan of the 1920’s). Either way you slice it, the Klan is bad medicine, and the Democratic Party needs to accept the fact that the Klan has *usually* been associated with it. But the GOP has had its dalliances with the Klan as well. So neither party’s hands are completely clean of this matter. Maybe both sides should simply denounce it and move on. Besides, there are plenty of other things about the Democratic Party to point and laugh about. Let’s not get stuck on one thing, shall we?